On an episode of Larry King Live, the actor Ashton Kutcher discussed reaching around 5 million followers on Twitter and the influence he believed the staggering number of fans afforded him. But when Alok Choudhary watched the episode, he wondered: What makes a popular actor, or any one person, company, or brand, influential? His subsequent research in the area of influence edification in social media would eventually pave the way to founding his data science company 4C, which is now changing how marketers advertise to consumers. Choudhary, Henry and Isabelle Dever Professor of Electrical Engineering and Computer Science at the McCormick School of Engineering, discussed how his startup achieved prominence as part of the Farley Fellows Seminar Series, where entrepreneurship-minded Northwestern faculty speak about their efforts to create companies. The talk took place May 14 in the ITW classroom of the Ford Motor Company Engineering Design Center. Choudhary’s pivot occurred when he realized that advertising was undergoing a convergence. Instead of following his original plan to build an analytics company based solely around social media listening, he saw the need to help organizations navigate the increasingly intertwined nature of social, mobile, and television advertising to better influence consumers. 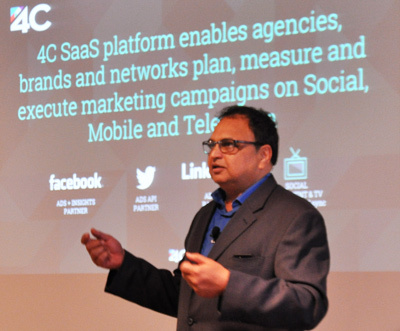 For Choudhary, the answer was 4C: a self-service software platform that allows agencies, brands, and publishers (like television networks) to more effectively plan, measure, and execute advertising campaigns. 4C’s algorithm tracks trillions of data points that reflect the behaviors of 1.5 billion consumers worldwide, including users within social networks like Facebook, Twitter, and LinkedIn. “Our Affinity metrics serve as our currency that tells companies how strong of a connection particular audiences have to their brand,” Choudhary said. “Companies can then determine what motivates their customers, and why they do what they do. If you understand that, you can shape your advertising to strengthen that connection.” He added such insights have helped companies achieve more optimized advertising campaigns and identify worthwhile sponsorships and partnerships. 4C counts among its customers some of the world’s largest advertising agencies, as well as 400 of the Fortune 1000 companies, including Procter & Gamble, Coca-Cola, and Samsung. Choudhary believes companies are drawn to 4C’s ability to translate complex analytics into actionable insights that can reach and influence consumers. Following his talk, Choudhary was asked if he identified himself more as an entrepreneur or an academic. He quickly noted the similarities.